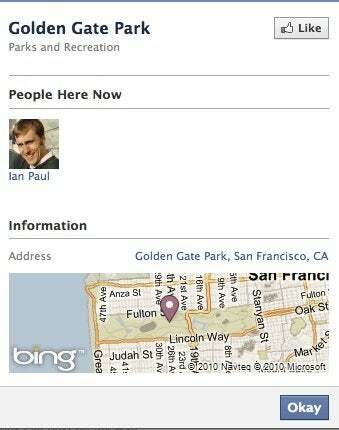 Watch out, Facebook users: the social network debuted a new location-sharing feature on Wednesday. As usual, this means it's time to make sure your privacy settings are configured the way you want them to be. Here's how you can maintain control over Facebook Places by adjusting your privacy settings. Places is a new location-sharing feature in Facebook allows you to broadcast your specific location to other Facebook users. You can share your location with all Facebook users, just your friends, friends of friends, or only the people you specify. 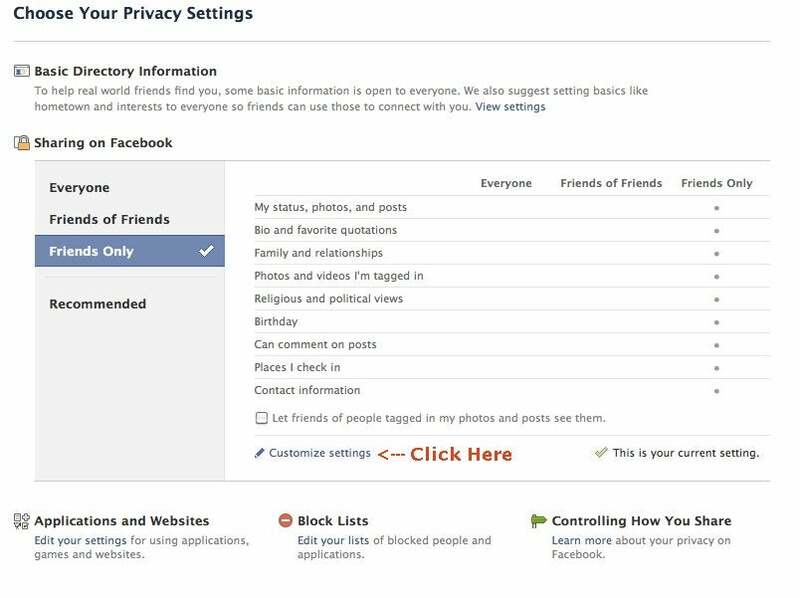 You can also use Places to check in your Facebook friends if their privacy settings allow it. To use Places, you need the Facebook application for iPhone or you can visit touch.facebook.com from your mobile browser. To use the Web version, your handset must support HTML5 and geolocation. 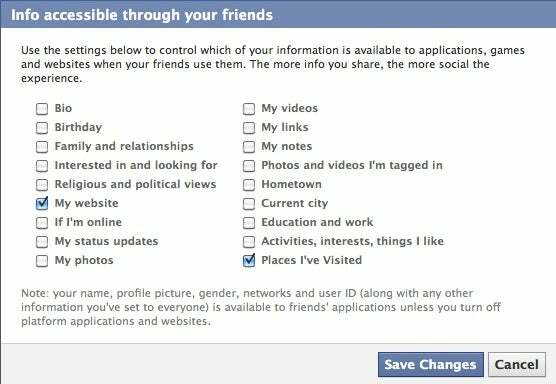 Places is available only to users in the U.S.
On the privacy settings page click on "Customize settings" under the heading "Sharing on Facebook." This will take you to the section where you can customize your Places settings. Who Sees Your Check In? The first setting you have to adjust is called "Places I Check In," and will determine who can see your Facebook check-ins. You will find this setting under the section entitled "Things I Share." There are three typical settings for "Places I Check In." You can set your check-ins to "Everyone" (all Facebook users will see every check-in), "Friends of Friends" (your Facebook friends and their friends will see your check-ins) and "Friends Only" (just your Facebook friends will see your check-in). If you need more granular control over your check-in settings select "Customize" at the bottom of the drop down menu. This will open up a pop-up window where you can set your check-ins to be viewable only by you or by specific friends in your friends list. You can also exclude specific people by entering names in the "Hide This From" section (a handy setting if you want to exclude co-workers, parents, or others from seeing your check-ins). After you've customized your settings the way you like, click on "Save Setting." Directly underneath your setting for "Places I Check In" is a checkbox for a feature called "People Here Now." This setting tells you what other Facebook users are at the same location you are. You don't need to be someone's Facebook friend to see this information because it is automatically viewable by everyone. If you don't want the world knowing when you check in to some location (or when a friend checks you in -- more on that in a minute) using Places, then you'll want to make sure this checkbox remains unchecked. This is perhaps the most crucial setting to consider. Unlike other location services, Places gives your Facebook friends the power to register check-ins for you. The good news is you can stop people from revealing your location. On the same page as the other two settings, look for the heading called "Things Others Share." The last setting in that section is called "Friends Can Check Me into Places." You can either enable or disable this feature; there are no customization options. If you choose disable, then any time a friend tries to check you in your name will be tagged at that location the way it would be in a status update. If you choose "Enable," then friends will be able to register check-ins for you. Whether you want to cede control of your location information to other people is up to you. Hold on, because we're not done yet. You need to adjust one final control that would allow third-party applications (such as quizzes and games) used by your friends to access your location data. 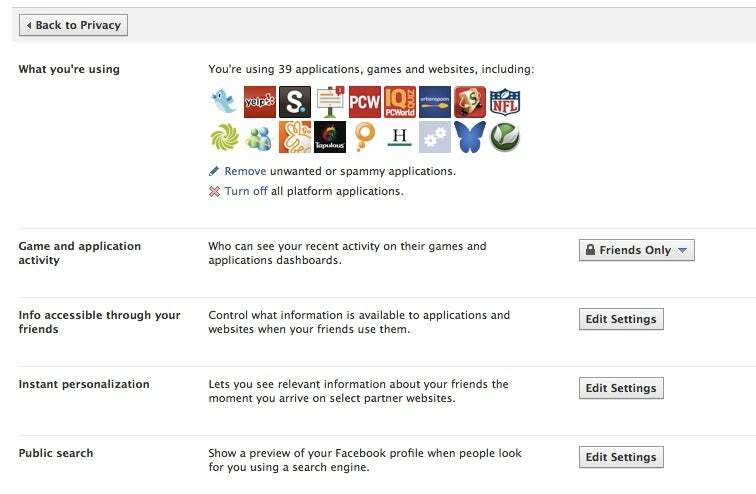 Facebook says that to adjust this setting all you need to do is "uncheck the new box in your Privacy Settings under "Applications and Websites." It would have been helpful if Facebook specified which box they were talking about, but based on what I saw in my own settings this is what you need to do. Also, note that in my tests this check box was activated by default. Go back to the top of the "Sharing on Facebook" privacy page and click the button that says "Back to Privacy" on the upper left. When you are back on the main privacy page, go down to the bottom and click on "Edit your settings" under the heading, "Applications and Websites." You should now be looking at a screen similar to the one above. Click on the "Edit Settings" button across from "Info accessible through your friends." You should now see a pop-up window that lists a variety of data types from your profile including biography, birthday, hometown, current city, and so on. Any of these items that are checked off are available to third-party applications used by your friends. Navigate to the box on bottom right called "Places I've Visited," and uncheck it if you don't want third-party applications that your friends use to harvest your check-in data. TIP: Third-party applications you personally use can get your location data only if you authorize that application to do so. The downside, however, is that if you don't want an application to access your location data then you won't be able to use that application. Places sounds like an interesting feature and will likely be a popular addition to Facebook. Just make sure you take the time to adjust your privacy settings so that you can control who sees your location and who can reveal your location on your behalf.